When did summer getaway homes become so generic? It's like there was some sort of unwritten rule that demanded that all luxury beachfront rentals be so communally... vanilla. 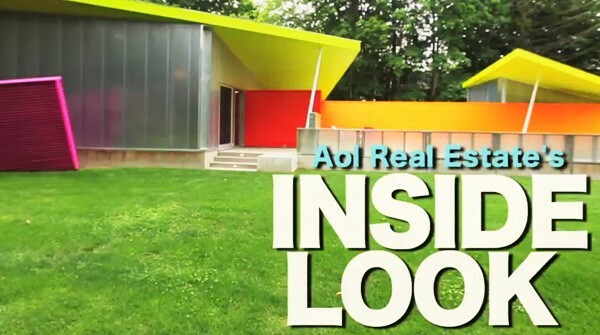 That is, until we got tipped off to this kaleidoscopically-hued summer contemporary named "Maison Plastique" in Shelter Island, N.Y.
With candy-colored exteriors -- "It looks like some sort of toy," our editor raved -- and equally eclectic insides, we were sold even before we saw the vacation home in person. You wouldn't believe how fast we hauled ourselves out of Manhattan and onto that ferry. Cool facts: The owners of the home are New York-based architects and designers Peter Stamberg and Paul Aferiat, of the internationally-renowned architecture firm Stamberg Aferiat. The home is the epitome of their signature euphoric color palette (neutrals, be gone! ), paired with sleek lines and untraditional construction materials. The result? Architectural alchemy. See for yourself! Like what you see? You can rent the home for $14,000 a month year-round, or $19,000 in August. Gina Surerus of Corcoran has the listing.